It has been a rather crazy week in my corner of the world. So, I am quite thankful to have a few minutes to relax, sip some coffee, watch the snow fall, and chat with you. Please, find a cozy spot in your world and enjoy a brief “time out” with me. Today, let’s chat about the issue of control…or lack thereof! Control. Something most of us desire. 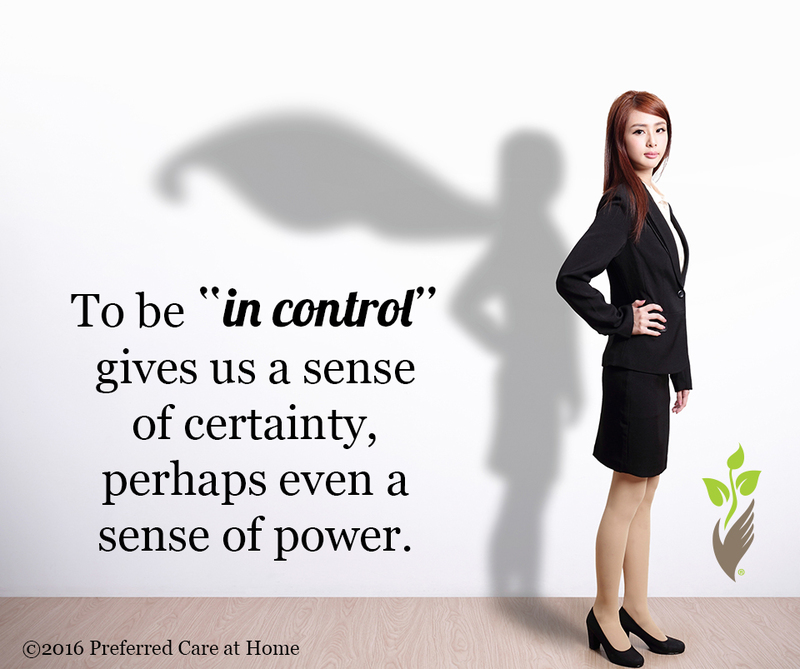 To be “in control” gives us a sense of certainty, perhaps even a sense of power. If we are “in control,” we feel assured that we know what is around the next bend. When “in control,” we believe our plans will unfold as designed. Right? Consequently, it’s no wonder that we long to be “in control” during chaotic, stressful times in life. Therefore, I speak to the issue of control in many of my educational programs for caregivers and care receivers. As I learned a few weeks ago, I need to practice what I preach! When presenting a webinar a few weeks ago, I was reminded that control is an illusion. Desirable, yes. But fleeting at best. During the webinar as I cautioned caregivers and care receivers to realize that control is elusive when dealing with a progressive illness, the silence of my sanctuary was shattered by the incessant barking of my dogs. Since I was tethered to my computer and in the midst of presenting, I didn’t have the option to run down the stairs and correct my dogs. I tried to retain my composure, focused on the subject matter. Since my dogs are typically not “barkers,” I prayed the cacophony would end quickly. Much to my dismay, the racket was soon intensified by the annoying sound of chainsaws—obviously the source of my dogs angst! A landscaping crew was moving through my neighborhood addressing the tree damage done by a recent spring snowstorm. Seriously? Continuing to speak in what I hoped was a very calm manner, I retreated to a windowless room—my bathroom. Although quieter, I am sure it sounded as if I had fallen into a well with the sound echoing off the tile. My anxiety level was off the charts. My world was spinning out of control. Not the webinar I had planned!